This Christmas Apple Nachos wreath with homemade caramel is great for a Christmas party and it's so delicious! 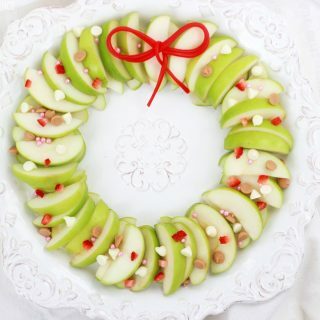 Arrange sliced apples on a plate in the shape of a Christmas wreath. Sprinkle chopped strawberries, peanut butter chips and white chocolate chips over the apples. Tie twizzlers into a bow for the top of the wreath! Drizzle caramel over the wreath and keep any extra close by, for dipping!